By Count Arthur de Gobineau. This is the classic study of racial variation and its effect on human society, which pioneered modern racial science. “I was gradually penetrated by the conviction that the racial question overshadows all other problems of history, that it holds the key to them all, and that the inequality of the races from whose fusion a people is formed is enough to explain the whole course of its destiny. Everyone must have had some inkling of this colossal truth, for everyone must have seen how certain agglomerations of men have descended on some country, and utterly transformed its way of life; how they have shown themselves able to strike out a new vein of activity where, before their coming, all had been sunk in torpor.” – From the author’s 1854 dedication to His Majesty, King George V, King of Hanover. P/B, 214pp. Joseph Arthur Comte de Gobineau (14 July 1816 – 13 October 1882) was a French aristocrat, novelist and man of letters. 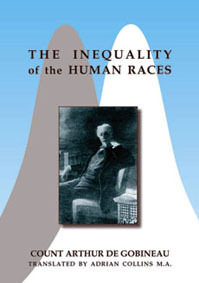 Gobineau belief the white race was superior to the other races in the creation of civilized culture and maintaining ordered government is expressed in this book An Essay on the Inequality of the Human Races (1853–1855). However, he also thought that the development of civilization in other periods was different from in his own and speculated that other races might have superior qualities in those civilization periods than in his own. ). De Gobineau is credited as being the father of modern racial demography, and his works are today considered very early examples of scientific 'racism'. He came to believe that race created culture, arguing that distinctions between the three races - "black", "white", and "yellow" - were natural barriers, and that "race-mixing" breaks those barriers and leads to chaos. He classified Southern Europe, Eastern Europe, the Middle East, Central Asia, and North Africa as racially mixed.